Bolivian Team Presents Study On The Origin Of Silala Waters, Chile to face a defeat and ridicule! Bolivian Thoughts opinion: Chile is under severe scrutiny and of course had to fabricate a “diversion” that may also turn against them. This issue only depicts its politicians as mere pirates and liars! Bolivia’s reasoning towards the invasion of our sea coast, as presented to the International Justice Court at The Hague, making us lose our maritime attributes, and requesting real dialogue so that we should have real access to the Pacific, and that makes them really uneasy. Silala water was diverted to Chile, forcefully and using great leverage and imposition by Chile, under the 1904 treaty, as an excuse to use that water for the railroad, is no longer applicable. Like the issue with the Loa river, Chile has great need for water. The region they took by force to Bolivia and Peru lacks irrigation for agriculture and for human consumption. So, take a look at this picture, from the internet, and ask yourselves, have you ever seen a river that wide and human-channeled?! It is clear Chile needs water, so … they should pay accordingly! enough with their robberies, cheap rhetoric, enough of their piracy! 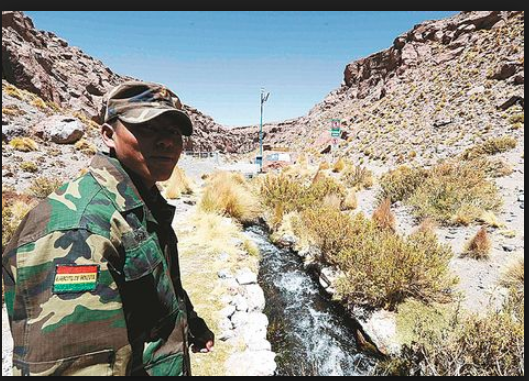 La Paz, Feb 14 (Prensa Latina) A group of technical experts presented today preliminary studies to a Bolivian legal team on the origin of Silala waters, for which Chile sued the Andean nation in The Hague. The Attorney General of the Bolivian State, Pablo Menacho, reported that the experts’ study included work and visits to Silala, located in the Bolivian region of Potosí (southwest), with the objective of strengthening the legal part. Menacho did not specify more details of the content of the information presented to the Bolivian jurists. Chile sued Bolivia in 2016 before the International Court of Justice, considering that these waters come from an international river and not from a spring as stated by La Paz. The plaintiff presented his report in July of last year and Bolivia prepares its counter memory, which must be presented before the ICJ before July 3. La Paz affirms that the Silala is a hydric reserve of groundwater artificially channeled into Chilean territory due to an effect of an agreement signed in 1908, which has already expired. This entry was posted in Bolivia, Environment, Potosi, Social Unrest and tagged 1879 Pacific war, water. Bookmark the permalink.